I flew to Girona from Rotterdam Airport. This is the view shortly after take-off. I stayed in an apartment in the Carrer de l'Argenteria, a shopping street in downtown Girona. The apartment also housed other visitors to the university, but I had a double bedroom all to myself. View down the Carrer de l'Argenteria from the apartment's front window. Night view from the kitchen window: the Basilica of Saint Felix (Església de Sant Feliu). The Basilica of Saint Felix during the day. Panoramic view of the Onyar River (Riu Onyar) from the kitchen window. Evening walk through downtown Girona: the Pujada de Sant Domènec stairs towards the Agullana Palace (Palau dels Agullana, at the arch) and the Church of Saint Martin Sacosta (Església de Sant Martí Sacosta). Evening walk through downtown Girona: the Agullana Palace. Evening walk through downtown Girona: view back down the Pujada de Sant Domènec stairs. Evening walk through downtown Girona: another "street", called the Carrer de l'Escola Pia. Evening walk through downtown Girona: the Basilica of Saint Felix (Església de Sant Feliu, left) and the Cathedral of Saint Mary of Girona (Catedral de Santa Maria de Girona) seen from the Pont de Sant Agustí bridge. The toy store at the ground floor of my apartment building. The Carrer de l'Argenteria shopping street, looking south from in front of my apartment building. In Catalan, an "argenteria" is a silversmith. The Carrer de l'Argenteria shopping street, looking north from in front of my apartment building. The Quatre Cantons, where the Carrer de l'Argenteria meets the Carrer de les Ballesteries (Crosbow Street, left) and the Carrer de la Cort Reial (Royal Court Street, right). Straight ahead leads to the Plaça del Correu Vell (Old Post Office Square?). The Quatre Cantons is at the southeastern end of the Call Jueu (Jewish Quarter). The Onyar River (Riu Onyar), looking north from the Pont de Sant Agustí (Bridge of Saint August). The Pont de les Peixateries (Fishmongers' Bridge), seen from the Pont de Sant Agustí. This bridge, also called the Pont de Ferro (Iron Bridge), was built by Gustave Eiffel, better known from the eponymous tower in Paris. Rear facades of the buildings along the Carrer de l'Argenteria, showing some great diversity. My apartment building is the fifth one from the left. The Basilica of Saint Felix (Església de Sant Feliu, left) and the Cathedral of Saint Mary of Girona (Catedral de Santa Maria de Girona) seen from the Pont de Sant Agustí. The Carrer de les Ballesteries (Crosbow Street), looking north from the Quatre Cantons. The Plaça del Correu Vell (Old Post Office Square?). Back during the time of the Roman Empire, this was the location of one of the primary gates into the city. The Carrer de la Força (Street of Strength? ), looking north from the Plaça del Correu Vell. The Força follows the old Roman Via Herculea (Hercules Road), an important route between the Iberian peninsula and the rest of Europe. A little further down the Carrer de la Força. The Carrer de Sant Llorenç seen from the Carrer de la Força. The Carrer de Sant Llorenç (Saint Lawrence Street). The Carrer Lluís Batlle i Prats, looking south from where it meets the Carrer de Sant Llorenç. The Carrer Lluís Batlle i Prats, looking north from where it meets the Carrer de Sant Llorenç. The tower in the background is the cathedral. The Carrer de la Claveria. The southern end of the Plaça dels Lledoners. The Plaça dels Lledoners with the cathedral in the background. The building to the right of the cathedral is the Episcopal Palace (Palau Episcopal), dating back to the 9th century. 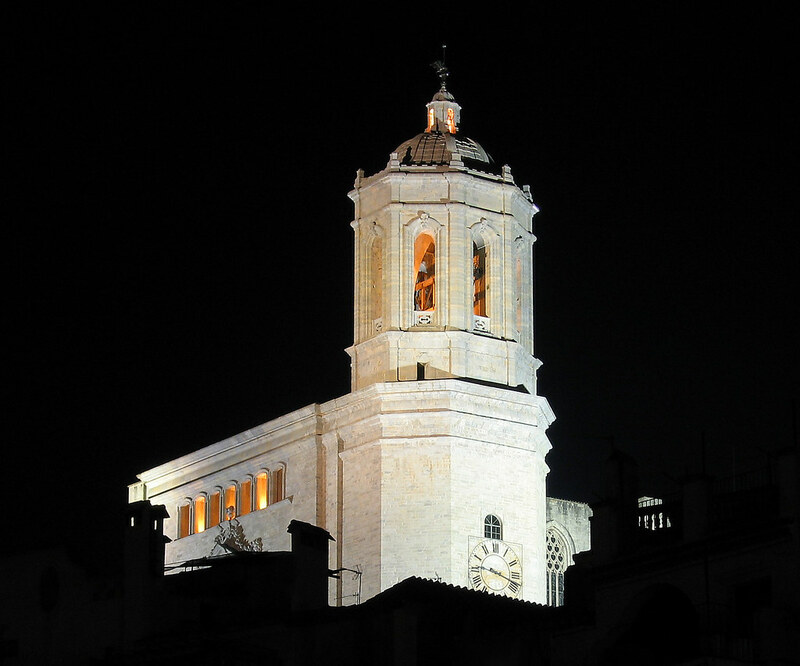 It currently houses the Museu d'Art de Girona, with collections of medieval and modern art. A tiny park on the east side of the Plaça dels Lledoners, backed by the Episcopal Palace and the cathedral. The Carrer de l'Escola Pia, another street consisting entirely of stairs. The Carrer de l'Escola Pia passes through a medieval wall. A medieval tower in the Carrer de l'Escola Pia. The upper half of the Pujada de Sant Domènec, seen from the edge of the Plaça de Sant Domènec. The Plaça de Sant Domènec (Saint Dominic Square) seen from the Carrer dels Alemanys (German Street). The building on the left is The Eagles (Les Àguiles), originally a 16th-century university. Further back stand the 13th-century Saint Dominic Monastery (Convent de Sant Domènec) and a 14th-century Gothic church. The Plaça de Sant Domènec seen from the other end, with The Eagles on the right. The the 13th-century Saint Dominic Monastery (Convent de Sant Domènec). This structure at the western corner of the Plaça de Sant Domènec is part of the Porta Rufina, one of the city gates back in Roman times. Some of the original Roman masonry survives near the bottom. Close-up of the original Roman masonry. The 13th-century Saint Dominic Monastery and the 14th-century Gothic church. The city wall seen from the Plaça de Sant Domènec. To the left stands the Eagles, to the right the Saint Dominic Monastery. Panoramic view of the city wall near the Plaça de Sant Domènec. Girona's city wall. The round tower dates to the 11th century A.D., while some parts of the wall itself go back to the 1st century B.C. Part of Girona's city wall. Looking to the northeast from the city wall. Looking to the east from the city wall. Looking to the northwest from the city wall. Looking to the southeast from the city wall. More bits of city wall. The 13th-century Saint Dominic Monastery and the 14th-century Gothic church seen from the city wall. The 13th-century Saint Dominic Monastery and the 14th-century Gothic church along the city wall. The Cathedral of Saint Mary of Girona (Catedral de Santa Maria de Girona) seen from the city wall. The 11th-century wall tower from nine photos ago. The cathedral and the city wall. View from the city wall across downtown Girona. The Onyar River, looking south from the Plaça de Catalunya. This is the road I follow from my apartment to the university. The Onyar River runs underneath the Plaça de Catalunya. The Rambla de la Llibertat shopping street, which changes into my Carrer de l'Argenteria a few blocks down. The Rambla de la Llibertat again, but now at 8:45 on a Monday morning. The Plaça de Catalunya across the Onyar River. Bike lines in Girona often lie on the left side of the road. This bike lane is somewhat separated from other traffic, so it's not so bad. Without that separation, which I've seen several times, it goes against my instincts to have the slower cyclists on the left and the faster cars on the right. I follow the Onyar River for about half of my commute to the university. It's hard to tell, but the bike lane lies in the middle of the road here. Maybe that's to discourage cars from overtaking cyclists on a narrow stretch? It had to be imported by car, presumably from the Barcelona area, but we had some snow in Girona this morning! This modern-looking church stands near the point where I leave the Onyar River for the remainder of my commute to the university. A bit of abrupt start and end to these bike lines. Or is the zebra crossing meant to be part of the bike lane? The Avinguda de Montilivi runs from the Onyar River to the University of Girona. The road is uphill for most of the way. More car-imported snow in Girona. Last night saw temperatures dip to -5 ºC, which is unusually cold for this area. The Faculty of Sciences (Facultat de Ciències) of the University of Girona (Universitat de Girona), covering such fields as mathemathics, physics, chemistry, biology and geology. The Faculty of Sciences (Facultat de Ciències) of the University of Girona (Universitat de Girona). Interior view of the Faculty of Sciences building. Interior view of the Faculty of Sciences building. This hallway houses the Intitute for Computational Chemistry (Institut de Química Computacional), which I visited for five weeks. My desk in the guest office. The Cathedral of Saint Mary of Girona (Catedral de Santa Maria de Girona), with the bell tower and the Door of the Apostels (Porta dels Apòstols). Construction of this door started in the 14th century (along with the rest of the church), but wasn't finished until 1975. Adjoining the cathedral is a 12th-century cloister, with a trapezoidal garden surrounded by these covered walkways. The walls and pillars are decorated with biblical and other designs. The cloister's garden with water well. The cloister dates back to the 12th century and was built in a Romanesque style. The Tower of Charlemagne (Torre de Carlemany) was built at the same time as the cloister. Two centuries later, the Gothic cathedral was built alongside the Romanesque tower. The cathedral seen from the cloister garden. The cathedral occupies the same site as an old Roman temple. Construction of the cathedral started in the 14th century and took two hundres years to complete. The nave spans 22 meters and is the widest Gothic nave in the world is 22. The Baroque façade and the neoclassical bell tower, both seen here, were finished in the 18th century. The stairs were built in the early 1600s. The Basilica of Saint Felix (Església de Sant Feliu). The Basilica of Saint Felix seen from the eponymous bridge across the Onyar River. This roundabout is an odd one: it does double duty as a parking lot and buses are allowed to go the wrong way around. Bus L8 demonstrates that indeed it does not have to go clockwise around the roundabout. The The Rambla de la Llibertat shopping street around 7:30pm. Three bikes without a seat. For some reason, theft of bike seats is a common occurrence in Girona. It happened to me twice in the span of four weeks. The Carrer de Ferran el Catòlic (King Ferdinand Street), just north of the cathedral. Behind the wall on the left lie the 12th-century Arab Baths (Banys Àrabs), modeled after the Roman counterparts. Exterior of the cloister attached to the cathedral. The Arab Baths (Banys Àrabs). The Passeig Arqueològic, east of the Arab Baths. The Passeig Reina Joana alongside the city wall. The city wall and cathedral behind it. The Abbey of Saint Peter of Galligants (Abadia de Sant Pere de Galligants). The former Galligants River, which used to drain into the Onyar River.